It has been a year since my biography was published on the lost Liverpool nineteenth century philanthropist Christopher Rawdon and to celebrate, the Rawdon history group invited Timothy Rawdon-Mogg, a descendant of Christopher’s brother Joshua, to visit some of the places associated with Christopher in Liverpool. First was a tour of Anfield where Christopher lived in Elm House and a photo opportunity for the local press outside what used to be the Rawdon Library and the monument on the old drinking fountain which is dedicated to Christopher and dates from 1863. The Library, recreation ground and drinking fountain were created by the Anfield Delph Trust which was set up by Christopher’s widow for the purpose of serving the people of Anfield and was a fitting tribute to a man who had supported the development of education for working people throughout his life. The next stop was a visit to the Ancient Chapel of Toxteth where Christopher and his brother James are buried. The Rawdon family were dedicated Unitarians, something that inspired their views on philanthropy, and the grave can be found next to their friends and fellow philanthropists Charles Pierre Melly, George Holt and members of the Rathbone family. 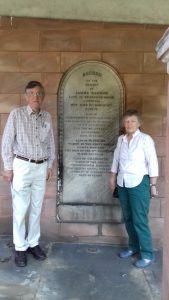 The final stop-off on the tour was a visit to St. George’s Church in Everton; the church was opened in October 1814 and in correspondence between Joshua and his mother Sophia, Sophia writes how she attended the consecration of the church and discusses how cast iron was used in the building. St. George’s is today widely known as the ‘Cast Iron’ Church. The group were allowed to climb the tower and were treated to a fine panoramic view of the Liverpool city skyline. 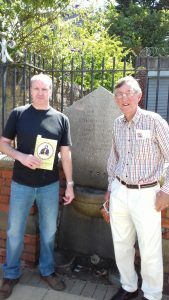 Timothy Rawdon-Mogg was the first member of the Rawdon family to visit these sites since the nineteenth century and was not only moved to be walking in the footsteps of his ancestors, but was humbled that Christopher Rawdon’s legacy was still visible in Liverpool, especially with the playground in Anfield that is still being used to this day. However, he was sad to see that the Rawdon Library had closed, its loss to the community reflecting many library closures in recent years. The vision of Christopher Rawdon and his friends was one that included education as an essential core to society, and this must never be forgotten.